If you’re looking for a total change of scenery while studying for your CELTA qualification, the UAE has a growing number of CELTA centres where you can study in comfortable, air-conditioned rooms while looking out over the awe-inspiring panoramic views of the sprawling cities below. 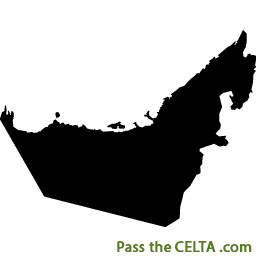 CELTA centres in the UAE are becoming more popular and this coupled with the high demand for qualified English teachers in the United Arab Emirates means there are plenty of opportunities for you to work as an English teacher in the UAE afterwards. The UAE is becoming a popular hub for those looking for a bit of adventure tourism and modernity. Studying for your CELTA in the UAE couldn’t be more exciting, especially in the country’s most famous emirates, Dubai and Abu Dhabi.